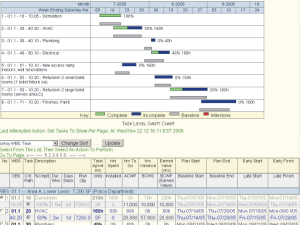 @schedule provides your project teams with controlled access to the latest schedule information. Access your schedules from anywhere using the Internet. Collaborate and communicate in real-time. @schedule breaks the schedule into easy to review pages. Each user sets the number of tasks to show per page. 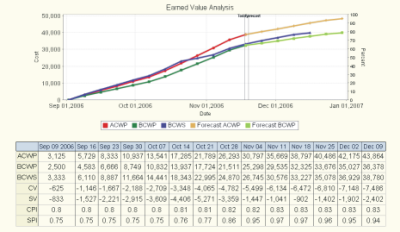 Create simple schedules or use advanced techniques like Earned Value, Work Breakdonw Structures, and Organizational Breakdown Structures. 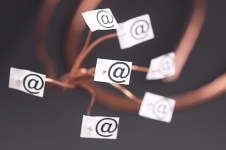 Multi-user schedule development and updating means everyone sees the same data real-time. How long does it take your projects to gather data and issue an updated schedule? 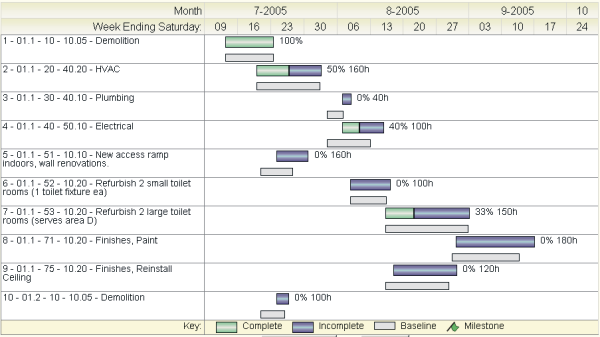 Above, detail task data is shown below the Gantt Chart. Page through the schedule by clicking on a page number. Page through schedules by clicking on a page number. Labor Forecast Graph: Weekly Plan, Baseline, and Cumulative Hours. Project Cash Flow Graph. Weekly cost and cumulative cost. Schedules can be updated more often and with less effort when people with task responsibility can review and update task status themselves. Project Managers and design leaders will get better information, faster. Creating task data is the most time consuming part of creating a new schedule. @schedule can create the tasks automatically from the estimate for you. You can save a lot of time and you can be certain that the schedule includes all of the estimated activities. Enterprise reports summarize information across all projects. Perform a fast review of all projects using reports that present only key project data. Review projects grouped by business unit or by office. Review current and forecast resource utilization. WBS reports at different schedule levels aide high level project reviews. True hierarchical Work Breakdown Structure and Organizational Breakdown Structure. Use any of ten different task sorting options when creating schedules or reviewing schedules. Projected Cash Flow by week. You can copy tabular data from our reports and paste the data directly into Excel. Data types are preserved. Click here for information on @schedule Editions and Pricing. The links below provide concise lists of @schedule's features. Click on one to learn more. Connect Your Project Team with @schedule! Copyright © 2005-2007 by ReedyRiver Group LLC.